With classic styling and superior build quality, the hipped-roof corner summerhouse gives you a great looking summerhouse which can be used throughout the year. The attractive hipped roof gives a distinctive look to your garden. 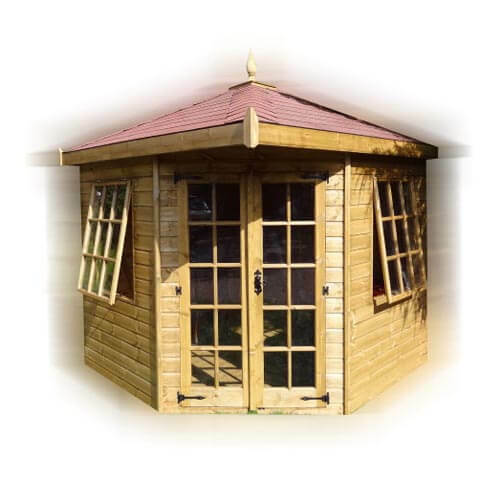 With a range of sizes from 6ft x 6ft to 8ft x 8ft, you get a great-looking summerhouse which fits your garden perfectly as a main feature or a hideaway. The hipped roof summerhouse features opening side windows and double doors, enabling you to make the most the summer weather. It also has an overhang over the door to protect you if the weather takes a turn for the worse.